While the vineyard of what we know of today as Chateau Ripeau has a long history in the appellation, with vines being planted in the 1700’s. The vineyard does not begin to gain notice until 1868. However, the modern era for Chateau Ripeau begins in 1917, when it was purchased by the family of a well-known Bordeaux negociant, Marcel Loubat and Marie Loubat. If you are wondering if the Loubat name sounds familiar to you, the answer is yes. They are from the same Loubat family that owned the legendary Petrus vineyard located in the neighboring Pomerol appellation. Chateau Ripeau has remained in the hands of the same family since that time. Chateau Ripeau takes its name from the sector the vineyard and chateau are located in. 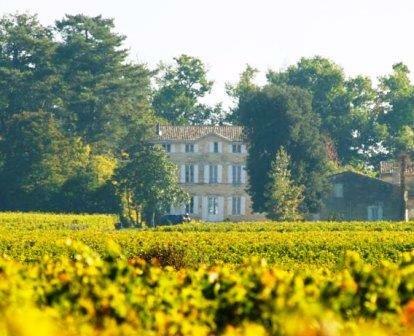 The vineyard has good neighbors as the vines are not located not far from Chateau Cheval Blanc, Chateau Corbin, Chateau La Dominique and it is also close to the Pomerol border. For a period of time, Alain Raynaud acted as a consultant to the property. In 1997, Chateau Ripeau renovated their entire wine making facilities. In December, 2014, Jean and Francoise de Wilde sold Chateau Ripeau to Cyrille Gregoire and Nicolas Gregoire, the sons of James Gregoire. James Gregoire is best known as the previous owner of Chateau La Riviere in the Fronsac appellation. The 16.1 hectare, Right Bank vineyard of Chateau Ripeau is planted to 65% Merlot, 30% Cabernet Franc and 5% Cabernet Sauvignon in 1 large, single block of vines. Finding a vineyard of a similar size in Saint Emilion in 1 parcel is not common. Since the new owners took over, the estate has gone through a modernization, as well as a partial replanting on the vineyards. By 2018, the Cabernets were been adjusted as the new owners added 5% more Cabernet Franc and removed 5% of their Cabernet Sauvignon. The vineyard is planted to a vine density of 6,666 vines per hectare. Located not far from Chateau La Dominique and Chateau Chauvin, the terroir is sand, gravel, limestone and clay with iron deposits in the soil. The average age of the vines is close to 35 years of age. Starting with the 2017 harvest, Chateau Ripeau moved to 100% self sustaining farming. To produce the wine of Chateau Ripeau, the wine is vinified in temperature controlled, stainless steel vats. Malolactic fermentation takes place in barrel. The new owners have increased the amount of new owk for the aging, so that today, the wine is aged in 100% new, French oak barrels for between 12 and 16 months. The first 4 months of aging process takes place with the wine on its fine lees. On average 5,000 cases of Chateau Ripeau are produced every vintage. There is a second wine, previously known as La Garenne de Ripeau, the new owners have changed the name to Tour de Ripeau. It is interesting to note that while 65% of the vineyard is devoted to Merlot, the blend can vary widely, for example, in the 2016 vintage, 90% of the wine blend is Merlot! Long time fans of the estate will notice another change. Starting with the 2015 vintage, the labels have been redesigned, sporting a much more modern, streamlined, artistic look. Chateau Ripeau is better with at least 4-6 years of bottle age. Of course that can vary slightly, depending on the vintage. Chateau Ripeau is best enjoyed in the first 5-18 years of life. Chateau Ripeau is best served at 15.5 degrees Celsius, 60 degrees Fahrenheit. The cool, almost cellar temperature gives the wine more freshness and lift. Chateau Ripeau is best paired with all types of classic meat dishes, veal, pork, beef, lamb, duck, game, roast chicken, roasted, braised and grilled dishes. Chateau Ripeau is also good when matched with Asian dishes, rich fish courses like tuna, mushrooms and pasta. Showing intense color, the wine pops with layers of fleshy, soft, dark plums, damp licorice and creamy tannins. There is body and richness here with loads of deep, concentrated fruit in the finish. The new owners are spending with no end in sight to make the best wine possible here. This is a property to watch. Dark in color, this wine offers floral, dark berry, licorice, smoke, chocolate and sweet cherries. Round, fleshy, forward and fresh, the wine was produced from blending 90% Merlot and 10% Cabernet Franc. Lush, silky, fresh and packed with black licorice, juicy, ripe plums and soft, polished tannins. Drink it now if you must, or give it 4-5 years to develop more complexities. The best vintage ever produced at Ripeau! The debut vintage for the new owners is a big hit with all its lush, ripe, fresh, juicy, dark red fruits, silky textures and finish driven by its licorice, black cherry, espresso and chocolate notes. This easily the best vintage ever produced at Ripeau. Medium/full bodied, with a really, supple, soft, lush textural quality to the ripe, sweet, juicy fruits. The espresso, spice and earthy notes add additional nuance to the forward styled wine that is already open and fun to drink. Clearly, this is the best wine yet produced in the history of the property. With new owners, who are willing to spend what it takes to make the best wine possible, the best is yet to come. The first vintage from the new owners shows a nice dark color, rich, supple tannins, sweet, lush, juicy fruits and chocolate-covered plums in the finish. This clearly marks a rebirth of the estate. The wine was made from a blend of 90% Merlot and 10% Cabernet Franc. Easy going, simple, medium bodied, cocoa dusted, cherry focused wine for early consumption. This soft textured, medium bodied, cherry filled wine has no faults, but lacks distinction. Soft, easy drinking, plummy wine, round textures and an earthy, dark cherry finish that is best consumed in its first decade of life. Mature, easy to drink, with a round, soft dark cherry and earthy core of fruit.